The last popular beach I’ve been to was Patong Beach on Phuket. It was jam packed with crazy backpackers, expensive lounge chairs, and barely any beach space. I have always tried to avoid “the place to be” on an island. I like to get off the beaten path and find a nice quiet place to just chill out and enjoy the beach. But I get a different feel from Kuta. Yes, there are tons of people. Yes, its crowded and yes, it has a McDonalds. But its not as crowded as I expected. The beach is long and spread out and I don’t feel claustrophobic while soaking up the sun in the sand. Although, its quite hard to take a quick cat nap. “Sarong, Sarong,” “Ice Cream,” and “Anana, Mango, Cold Drink” are heard every other minute and their sellers like to linger, just in case you change your mind. There are plenty of restaurants to choose from, with a hawker center right on the beach that is delicious and has nasi goreng to pizza to falafel, surfboards line the sand, the sun is always shining (well almost always, I got stuck in a juice bar for an hour trying to wait out a freak storm) and a Bintang beer is always easily attainable. 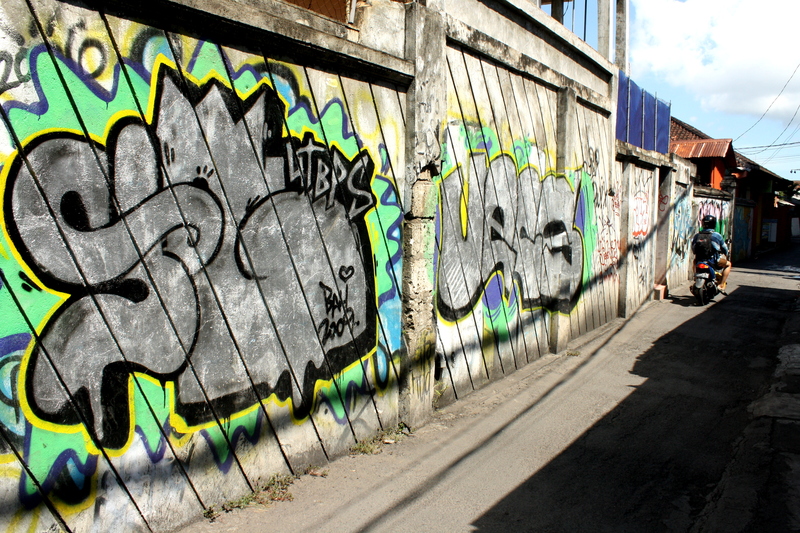 The streets of Kuta - A far cry from the streets of Ko Tao or Ko Jum!